To be honest, I originally had 0 intentions of getting the "new iPhone," because I just got the 5S last year and I wasn't going to order one and wait a month to do it or wait in line for hours on opening day. Well, I guess that changed quickly when last Tuesday, there was an available upgrade in my plan. So out of curiosity, I decided to give it a shot, just to try my luck. After making the impulsive decision that day to "get the iphone," I was able to pick up the gold iPhone 6 at the Apple Store on 5th Avenue and made a friend while waiting in line as well. I thought this phone would be too big but it happens to be the perfect size. I traded in my 5S at the Apple Store so I was able to upgrade and not pay a thing. The 6 fits nicely in my hand and the extra screen space definitely is beneficial. Compared to my past iPhones, those all seem so small and heavy now compared to this one. I'm quite fond of clear cases, and seeing as how my Case-Mate case for the 5S was very good, I got the same case for the 6. It protects my phone without being too bulky while still showing off the gold back. 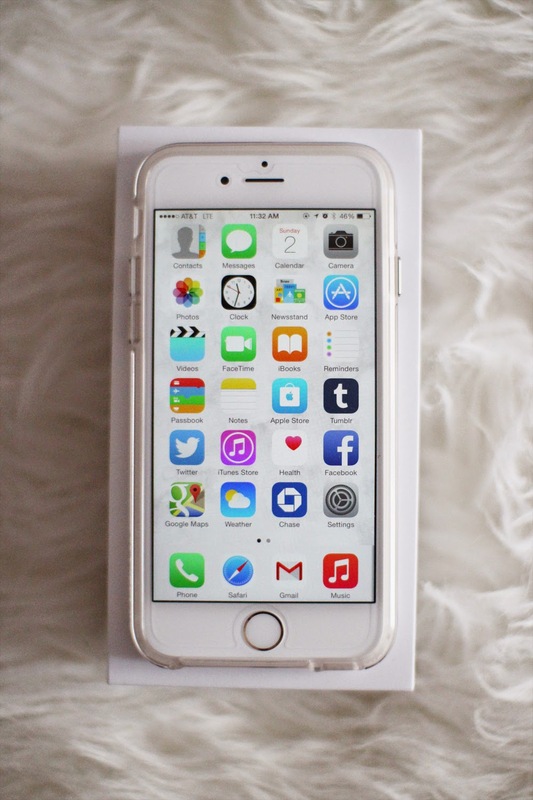 Read more to see what apps I use on my iPhone and how my phone is set up! iPhone 6 in Gold (16GB) for AT&T with Naked Tough case from Case-Mate. I don't like having to flip through a ton of pages when it comes to my phone. Like my taste in clothes and decor, I prefer to have things a lot more simple. My lock screen is a photo of my boyfriend and I with my home screen being a marble pattern. I love how a white background looks with the white phone. My first page houses all my basic apps such as contacts, messages, clock, etc. Folders on the second page include apps falling into the following categories: Productivity, Finances, Shopping, Games, Travel, Photography, Utilities, and Favorites. All of my apps are in folders except for my top two most used apps: Instagram and VSCO. I think it's safe to say these are probably my favorites. People often ask me, "What filter do you use?" and to be honest, none. I prefer the non-filtered look nowadays and if anything, the only editing I do is straightening the photo, brightening, sharpening, etc. Just some basics to improve the look of the photo. The camera on the 6 is magnificent and I have yet to encounter any issues with the device itself. The lock button is now to the side and it's actually a lot more convenient. Another one of my favorite features is still the fingerprint unlock. Because I did have an available upgrade and trading in my old phone in store would mean the 6 would cost me nothing, I figured, why not? It's the perfect size and has great battery life. Social Media is my biggest use for the phone. It allows me to keep in touch with everyone whether it's through Twitter, Facebook, Instagram, etc. I often browse through the Houzz app and Pinterest as well when it comes to finding inspiration for my Interior Design Projects. As for just killing time, you'll find me browsing through online shops, Vine, or Tumblr. Has anyone else gotten the iPhone 6 or 6+? What are your thoughts and what are some of your favorite apps that I should check out? Let me know and I hope everyone has a wonderful weekend!